China is the largest alcoholic beverage producer and consumer in the world, consuming one-third of the world’s spirits and a quarter of the world’s beer. Its beer production ranked first in the world for 14 consecutive years and the country has become the world’s fifth-largest grape wine producer already, according to Xinhuanet. In 2017, the output of beer and grape wine amounted to 44bn litres and 1bn litres, respectively. China’s soft drinks consumption has also grown at a fast pace in the past decade, especially that of healthy and innovative products. In 2016, the sales value of fruit juice drinks grew by 3.6% y/y, according to AC Nielsen. In 2020, the sales value of energy drinks is expected to amount to RMB 163.5bn, according to China Food Newspaper. 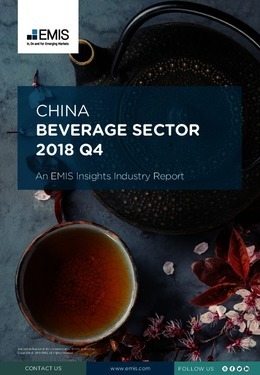 This report provides a complete and detailed analysis of the beverage sector for China. EMIS Insights presents in-depth business intelligence in a standard format across countries and regions, providing a balanced mix between analysis and data. Build a clear picture of trends and issues for sub-sectors (e.g. alcoholic beverages and soft drinks).